At the LA Marathon Finish in 2012. Hi, I’m Lindsay. Thanks for visiting fitandawesome.com. You’re probably here because you want to learn a little more about me. So here you go! I’ve been athletic my whole life. I played soccer growing up, practiced taekwondo, and started surfing and snowboarding when I was 15. In college I continued to workout and began running. After college I began registering in local running races. 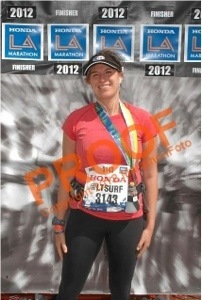 In 2010 I competed in my first triathlon and in 2012 I ran the LA Marathon. Now I eat a strict gluten-free diet. I’ve lost almost 20 pounds since going gluten-free in April 2012 and I feel great. My husband Marion and I got married in September 2012. We live in the South Bay in Los Angeles with our two young daughters (Baby Awesome and Baby Strong) and our golden retriever, Kona. We try and stay pretty active surfing, snowboarding, running, and swimming. I’ve worked in digital marketing for the past 15 years and have always been active online sharing information with others. I created Fit & Awesome as a way to share what I’ve learned and what products have been useful to me in my health and fitness journey, connect with other like-minded individuals, and to pay it forward and help provide a resource to others who may be starting off in their health and fitness journey or just want to learn more about gluten-free living. There is a lot of great information out there on all these topics and so many people have been instrumental to my health journey that I now want to play a part in helping to spread the word. Now I am fit, awesome, and loving it. I hope you enjoy, and I welcome all feedback. Or you can contact me here. And while you’re at it, subscribe to my site and be the first to know when I have new posts! New here? Post in the comments and say hello!